Doomsday and Bizarro are at each other when Regime Superman arrives. 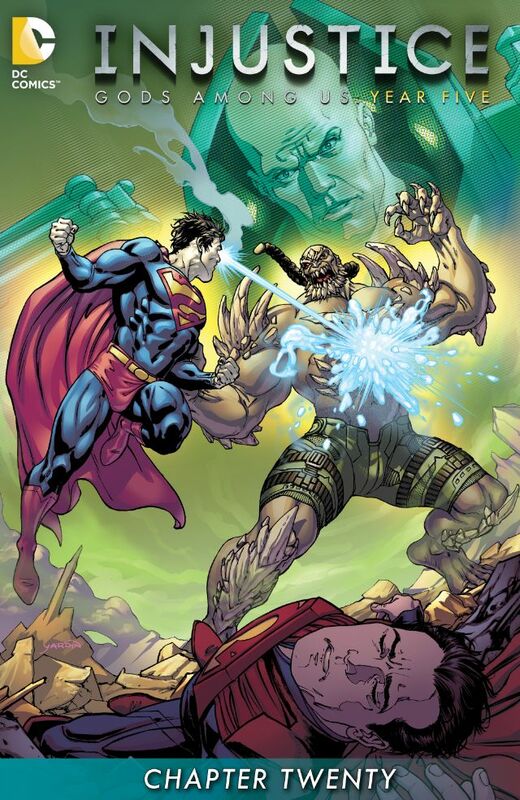 Despite Doomsday's strength and ferocity, he is losing to Bizarro. Regime steps in to assist his mind-controlled nemesis, but Lex Luthor sees a window, and has Doomsday attack Regime. Bizarro attacks Regime as well, and his defeat seems certain, but Luthor refuses to murder Regime, and returns Doomsday's attentions to Bizarro, whom he promptly kills. Regime is left without answers, and leaves Bizarro with Luthor, charging him to discover where Bizarro came from. Story - 3: Story-wise, the execution is better than expected. The sequences connect well, and by issue's end, it's hard to say that it wasn't a rewarding read for anyone who's been enjoying Injustice thus far. However, the fight, and the treachery that enters if, were so light and wasted, it's hard to come away with more than a shrug by story's end. A match between these three power houses could have been quite dynamic and very visually appealing, but Injustice makes the same error too many comics do when it comes to these situations. Rather than let the battle tell the story, Buccellato splits between a less than mean fight, and a needless transition. Readers who've been with the book this long know that Lex will get away with his machinations. What they don't know is how a full-on match between Bizarro, Doomsday, and Regime Superman will play out, after being offered the scenario. Four more to go. Stay the course, good people, stay the course. Art - 3: Miller's line work here is quite uneventful, and downright unenergetic. It feels like he wasn't in to it, and it shows.